My gems p38 has the original head unit, which is working, in that it plays reasonable quality audio from the radio, and knackered, in that the display is illegible (looks like it might have had water in it :/ ). What are my options here? Can a replacement LCD be fitted to the head unit by a clumsy oaf like myself? Anyone know a shop specialist able to do the job? Second problem is that changing head unit mode to cd produces no sound for 5 seconds or so, then reverts to radio. The changer only has one cd in it, but I'd think the system can cope with that case, if its working correctly. What I'd really like is a bluetooth capable replacement head unit, but Google doesnt offer any obvious solution, so I guess that's non-trivial? Thoughts and suggestions much appreciated! Clarion can do a full refurb on your original stereo and add a line in cable for £95. However, the last one I sent to them (in the Ascot) had a completely dead display and they phoned me to say that the displays were no longer available and all they could fit was a Grade B one. It may be Grade B and not perfect but it works fine. I suspect there is a problem with the CD player so it is checking for a disc, can't find one, so going back to radio. If you had a working display it would tell you what the problem was. It might just need a CD head cleaner putting through it. 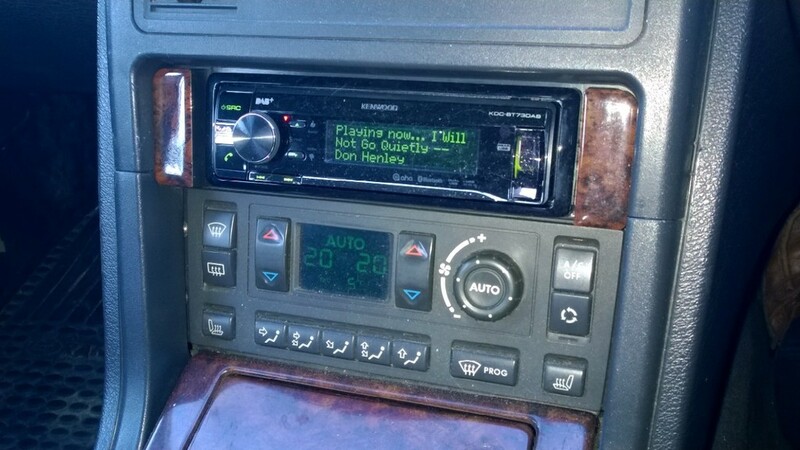 I've got the predecessor to this https://www.kenwood-electronics.co.uk/car/rec/dab/KDC-BT730DAB/ in mine. Does everything I need it to do and more. If you've got the amps in the doors you'll need to make some attenuators to drop the level from the head unit. As it is narrower than the original space in the facia you need to add these either side of it https://www.ebay.co.uk/itm/Range-Rover-P38-1994-2002-Car-Stereo-Radio-Single-Din-Facia-Trim/263073021476. I got stick on wood to put on mine to make them look the part. Clarion can do a full refurb on your original stereo and add a line in cable for £95. That sounds just the ticket. Do you have an email contact or website link I can follow? I bought a cheapy Bluetooth receiver board from eBay, and grafted it in to the stereo replacing the audio in from the cassette deck. With an external microphone it even works as a hands-free kit, with reasonably acceptable audio quality.